Known for its very popular Mandawa Fort, Mandawa is a quaint little town in the Jhunjhunu district of Rajasthan. Popularly known as the Open Art Gallery, the town is replete with paved archways and magnificent havelis and fortresses. is located in the heart of the Shekhawati region and is dotted with palaces and splendid mansions (havelis). The aura and vibe of the place reflect the social and cultural environment of the place in the bygone era. Owing to its royal rendition, it is also a hot spot for movie shoots and is filled in by media on and off the year. Best known for its attractive and colorful paintings, Binsidhar Newatia haveli is among the major tourist attractions in Mandawa. The place holds a great historical importance alluring thousands of history buffs and tourists to this place. Settled in Shekhawati region, Mandawa is a small town which boasts of several brilliantly designed havelis and forts. 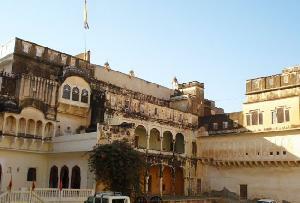 In fact, these striking havelis and forts constitute major portion in Rajasthan tourism. Built by a Rajput merchant, Murmuria haveli in Mandawa boasts of number of paintings which are main attractions of the place alluring thousands of history buffs and tourists. The beautiful paintings include paintings of cars, trains, George V and Venice. There are pictures of Lord Krishna with his cows and Jawaharlal Nehru on a horse back holding National flag. You also get to see a long wall-painting depicting a train with a crow flying above the engine. A beautiful town in the Jhunjhunu district of Rajasthan, Mandawa is a centre of art and culture. 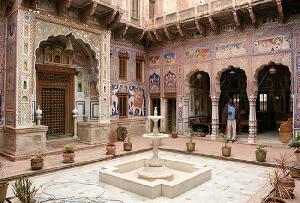 The place is dotted with a number of havelis which feature the most amazing murals and architecture. Of all the havelis in Mandawa, Jhunjhunwala Haveli is the most beautiful and most visited attractions. 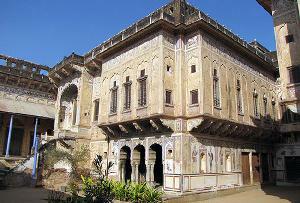 Built back in the year 1859, Jhunjhunwala Haveli is best known to feature traditional Rajasthani art. The architectural beauty of the structure leaves every visitor spellbound. The haveli has latticed windows and beautiful wooden doors which make it stand out among the rest. The creativity of Rajasthani artists can be seen through the decoration on the walls of the haveli. The Gulab Rai Ladia Haveli is one of the most palatial mansions of Mandawa. The haveli is considered an exceptional piece of art and architecture for its exotic imagery. Even today, the haveli is known to hold the old vintage charm and ambiance.The walls of the haveli reflect the glory and wealth of the past era. The haveli features exceptional murals in varied themes. One can find images on the walls of the haveli which depict different scenes like a woman giving birth, mirror images of tigers and horse, bird tending her eggs and many more. The main attractions of the haveli are its beautifully carved wooden gates and latticed windows which talk of the originality of the artisans of those times. With paintings of camels and horses, the façade of Goenka Double Haveli is embellished and looks extremely attractive. There are two entrances here, both an epitome of grandiose. 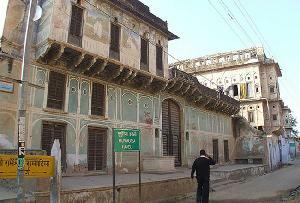 Rajput Merchants founded the haveli in 18th century. In its every nook, a flawless display of Rajasthani art is put into display. Frescoes, motifs, paintings, carvings and other designs have been carefully embedded. There is a perfect mesh of Indian and European style of decoration; evident through paintings of Rajasthani women and European men wearing hats. Luxury has inspired the designs of the rooms. 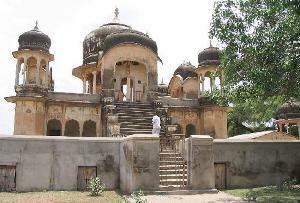 This mansion is considered as a popular tourist attraction of Mandawa. Regarded as an open air art gallery, Goenka Chattri monument is datable to 18th century. Its name has been given after the Goenkas, who once lived in this mansion. 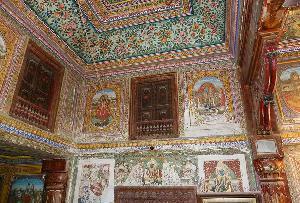 The walls are embellished with paintings and frescoes having semblance of Rajasthani heritage. Yesteryears’ opulence is still untouched and intact. Spacious and arched doorways are insignia of grandeur, and a display of artisans’ precision. Many images of Lord Krishna are found in this haveli, suggesting immense faith in god, by the people of bygone era. A visit to Goenka Chattri will make it clearer to you why this is considered to be one of the best tourist attractions of Mandawa.